One of the first things that they teach you in whatever version of driver’s education that you take is that if you hit someone from behind - you’re the one in trouble. “You are, as the following vehicle, responsible for maintaining a safe distance from the car in front of you,” is what our teachers, police officers, and judges all seem to agree upon. You must be prepared for someone to slam on their brakes and attempt to make a full dead stop in front of you at all times. It’s the law. Somehow, some way - even though we are all taught this, in some situations the person behind you will try to make it out to be your fault. That exact scenario played out in front of the racing world in Baku on Sunday. Vettel claims that he stopped immediately and fully when he first saw the car ahead slowing. 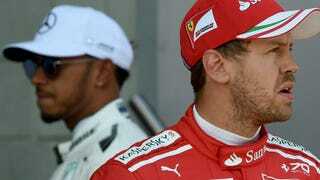 Vettel claims Hamilton suddenly and unnecessarily slammed his brakes. After watching the tapes: here’s what I see. Hamilton pumped his brakes four times prior to the contact causing 5th depress. On each of those four pumps the Mercedes slowed down more quickly and shed more speed than on the final blip of brakes that resulted in Vettel hitting the leader from the rear. Watch the video of the aftermath: By Clicking Here. It seems blunt to me, the shunt and what caused it. Sebastian Vettal hasn’t had a real shot to win a title in four years. His belief that he should be ahead has overtaken the part of him that controls his car - his brain. If F1 is primarily for entertainment, keep it coming Seb. We all know you’re a killer robot somewhere inside of there. If your zombie brain is willing to display NASCAR levels of aggression on another F1 driver, maybe a little mindlessness is exactly what this sport needs. Did Liberty Media put you up to this? Or were you just simply trying to liberate your sick, nasty speed. We’ll never know for sure. Drive safe, and don’t follow too closely.